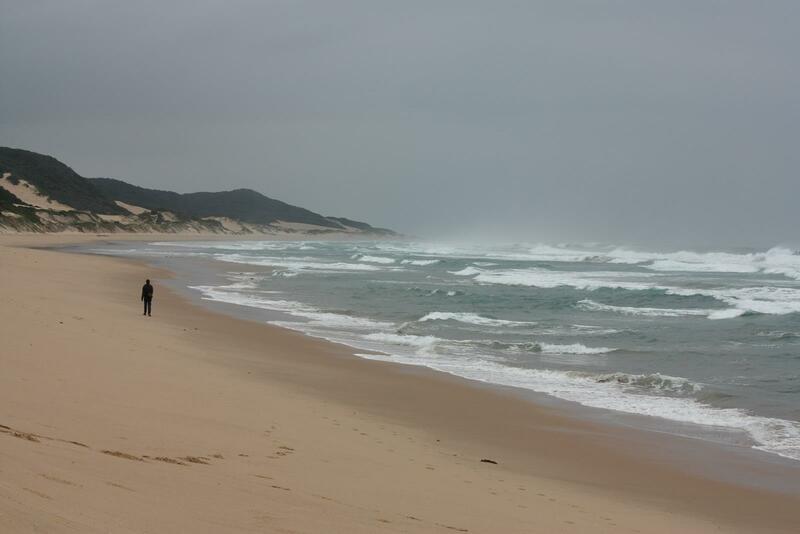 The iSimangaliso Wetland Park in northern KwaZulu-Natal was listed as South Africa’s first World Heritage Site in 1999 because of its ecological value, natural beauty and biodiversity. 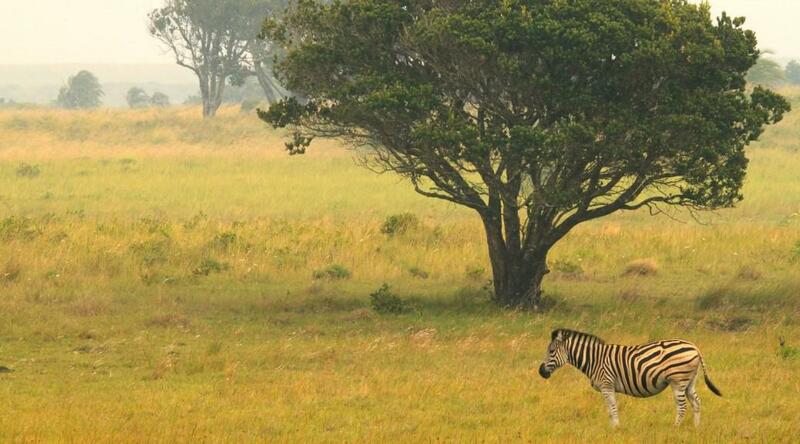 The name iSimangaliso means ‘miracle and wonder’which aptly describes this unique place. 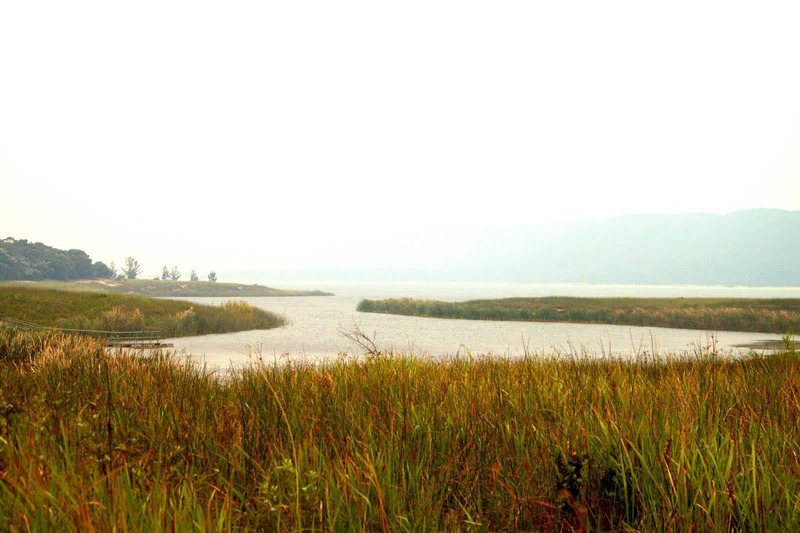 The 332 000 hectare park contains three major lake systems, eight interlinking ecosystems, most of South Africa’s swamp forests and Africa’s largest estuarine system. Growing up in the Transvaal and Zimbabwe respectively we know of many friends and relatives who have been down to Sodwana Bay, Kosi Bay and St Lucia to fish, dive and snorkel. In the past some irresponsible cowboys drove their 4WD vehicles on the beaches and caught fish to their heart’s delight. However, since the stretch of coast from Cape St Lucia to the Kosi Bay Estuary on the border with Mozambique was incorporated into the iSimangaliso Wetland Park everything possible is being done to protect and conserve this unique environment for current and future generations. We were greatly looking forward to visiting this unique park but were still taken by surprise! From the moment we entered Bhangazi Gate just north of St Lucia town, the countryside consisted of low rolling, grass covered dunes towards the coast, interspersed with patches of dense natural forest. We drove along short loops off the main road and were startled to see warthog, blue wildebeest, Bushbuck and Duiker. The herds of Kudu were especially impressive with many bulls sporting enormous, regal sets of horns. 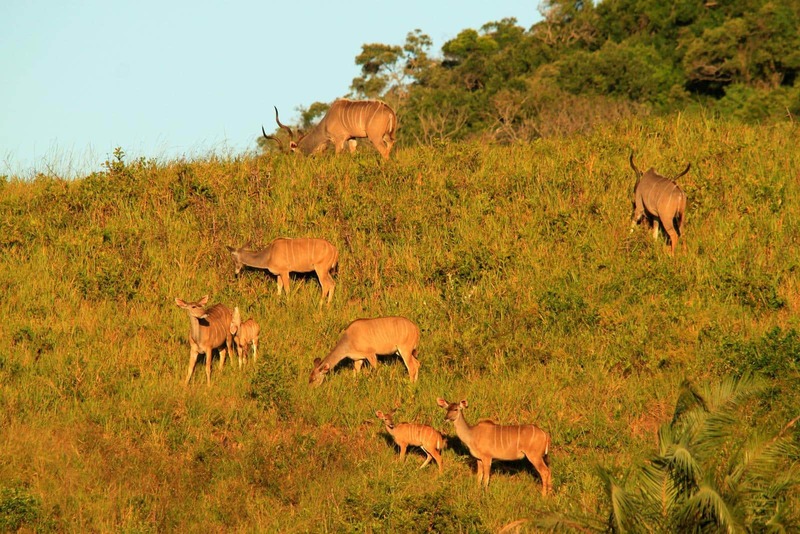 A herd of Kudu grazing in the afternoon sun. As Africa’s largest estuarine system, Lake St Lucia is 80km long and 23 km across at its widest point and home to over 800 hippos and 1 200 crocodiles. It also hosts large flocks of pelicans, flamingos, ducks, waders and a variety of fish and other aquatic species. Arriving late at the Cape Vidal campsite we decided to go with a minimalistic set up of the roof top tent and swing down kitchen which enabled us to be out early the next morning to explore the park. We were rewarded with an astonishing site; three adult black rhino right next to the road, one of which sported an enormous horn, perhaps 75cm long. According to park authorities 14 000 hectares of commercial plantations have been removed and the land rehabilited. 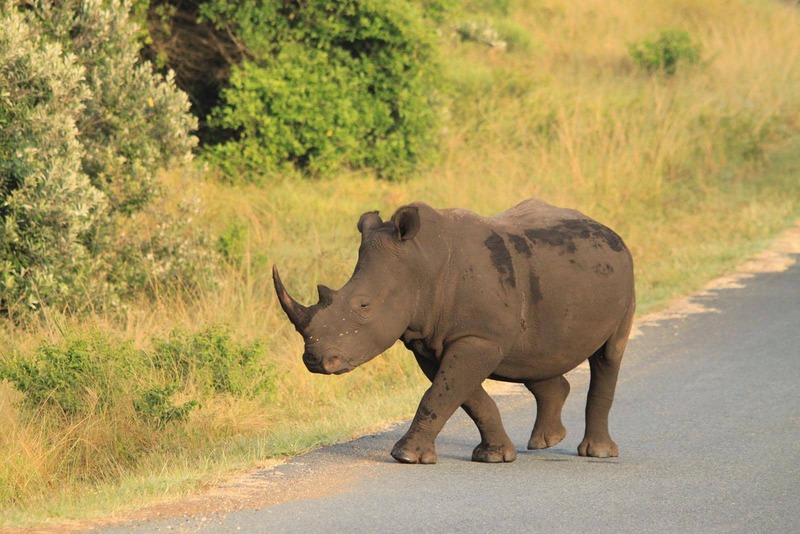 Game species such as elephant, wild dog, cheetah, Oribi as well as black and white rhino were re-introduced into the park. There seems to be more game in the southern end of the park up as far as Umkhuze compared to the narrow stretch of coast north of Sodwana Bay. We were taken aback by the variety the park has to offer; from game, beautiful landscapes, natural forest to the bounty of the sea. Once again the endless beach provided excellent running opportunities to us but clearly the average visitor prefered to settle down for the day on the sand, swim and fish. 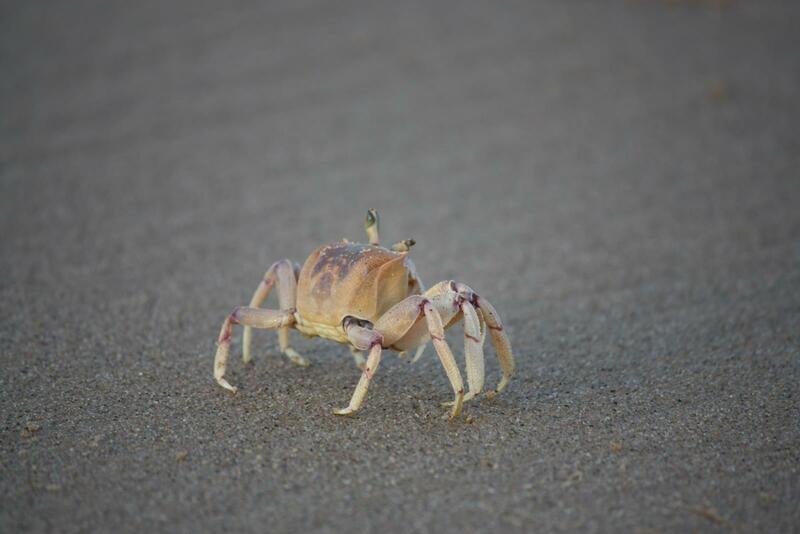 Hundreds of hand sized crabs enjoy the beach. The Cape Vidal campsite is well shaded with lofty trees, and proves to be the playground of mischievous vervet monkeys. 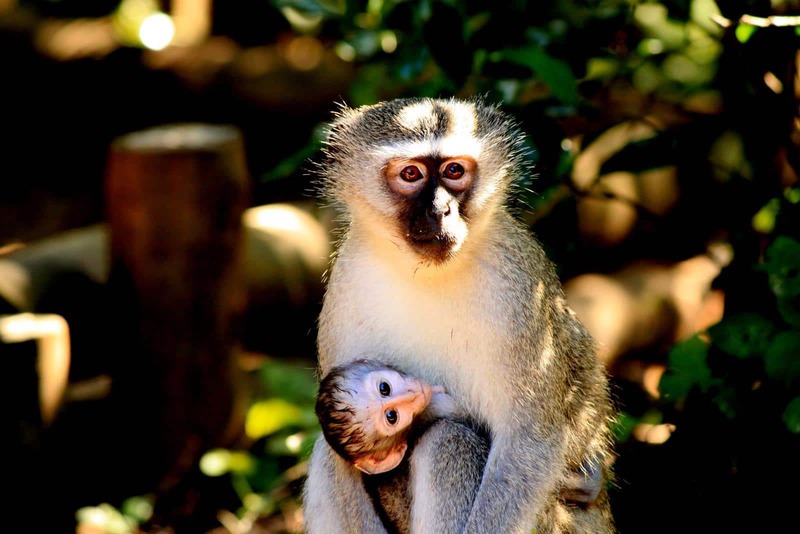 A vervet monkey mother carrying her baby. One of the items of equipment we had brought was a stovetop pressure cooker, in anticipation of the less than tender cuts of meat we expected to find further north. Prior to entering the park we had bought several packs of stewing beef and made these into a large and delicious curry, which would last us several days, the left overs stored in the pot and improving in flavour. On our first morning game drive we left the pot out and arrived back in camp to find that the monkeys had tried to raid our camp. Fortunately the sealed pressure cooker proved resistant otherwise we would have lost a flavourful meal! Our new stove wasn’t burning properly, possibly because of impurities in the gas and Pete needed to fix it. Not an easy task with the marauding monkeys! I had to stand guard all the time. Several very tame Duiker and Bushbuck wandered around the camp, and one young Bushbuck ram took a long drink from our wash stand rinsing water, then gazed at us with soft eyes as we moved around. 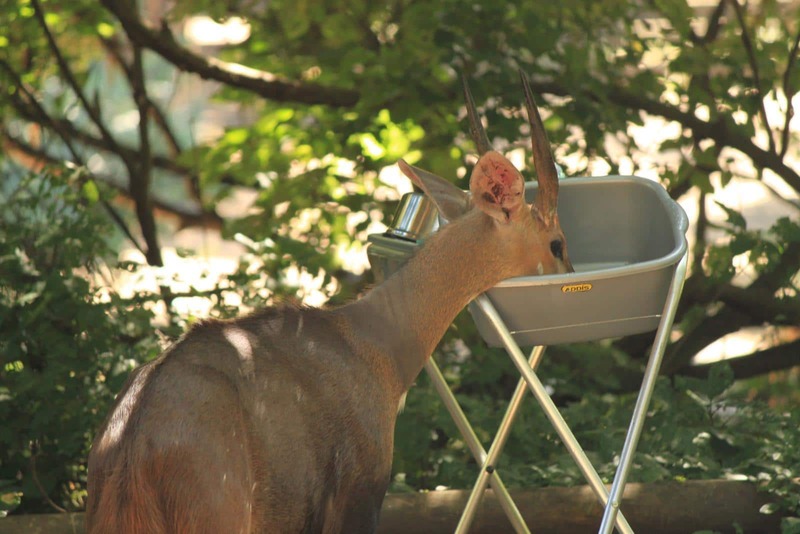 A Bushbuck drinking from our wash basin. 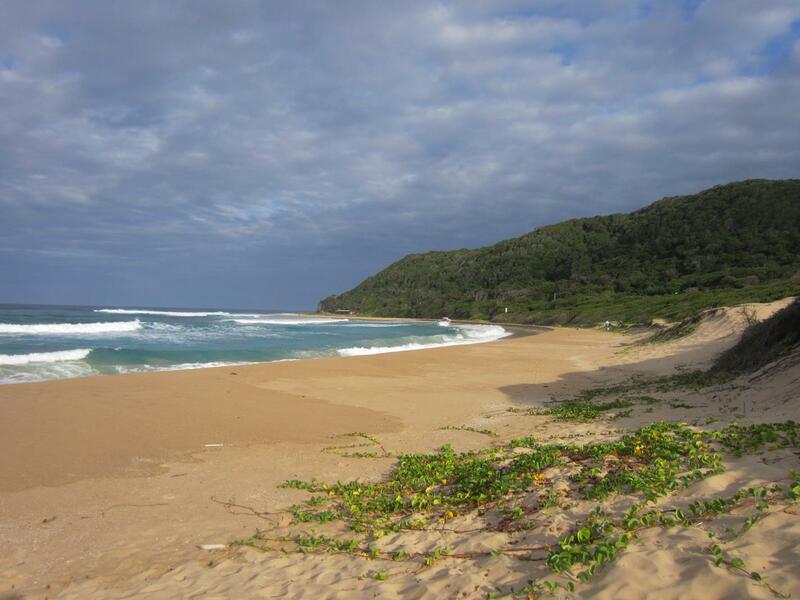 Our next destination was Mabibi Beach Camp, towards the north of the iSimangaliso Wetland Park. Upon re-entering the park at Baya Gate, the park warden advised us against going to Nine Mile Beach because of theft from parked vehicles. This is very sad as this location is known as one of the best scuba diving sites around Sodwana Bay. 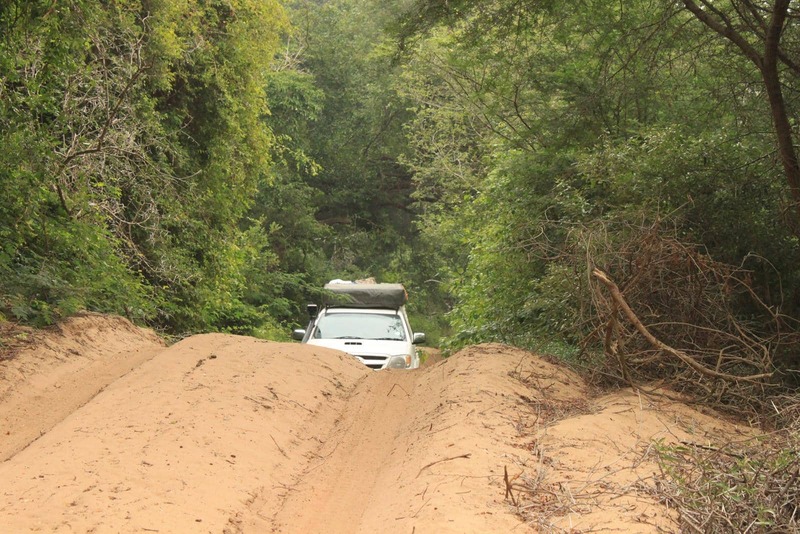 Once we had left the tar we drove along the shores of Lake Sibaya on a narrow, red sandy and very beautiful jeep track, wide enough just for one vehicle. Many steep undulations, deep sand and a high middelmannetjie had us wondering about our high tyre pressure but the Hilux coped admirably in four wheel drive. We enjoyed this beautiful, undulating sandy track. At times the thick vegetation had been cropped precisely to vehicle width and the trees formed a leafy canopy overhead. A rare flock of crested guinea fowl made us stop and pull out the cameras. 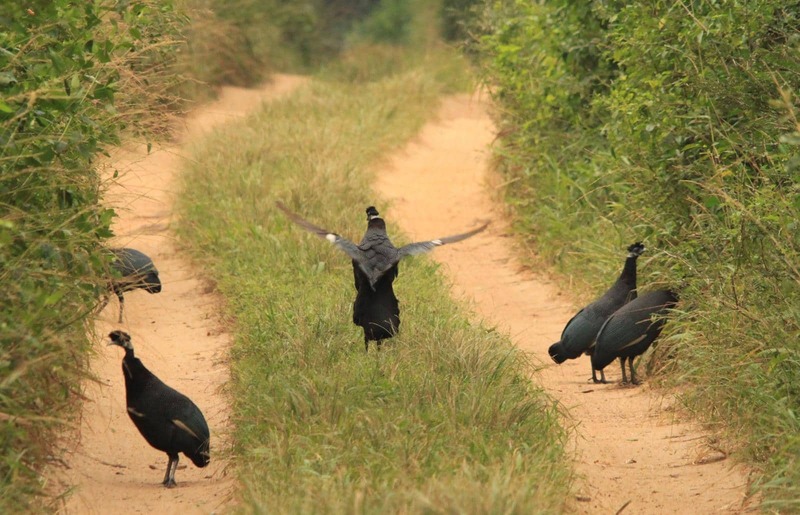 Guinea fowl in the road. Lake Sibaya is South Africa’s largest fresh-water lake. Tucked against forested coastal dunes, its crystal clear waters are home to KwaZulu-Natal’s second-largest population of hippos and crocodiles. Approaching Mabibi we swung away from the lake and moved closer to the coast and our secluded campsite, out of sight and hearing of others, and with the noise of the surf in the background. The beach was just a few hundred metres away and like the rest of this awe inspiring coastline, it offers amazing opportunity to enjoy the ocean. Make sure you bring drinking water and a fishing permit with you or buy one from the nearest Post Office at Mbazwana otherwise you may end up with a R1 000 fine just to catch something for the pot. 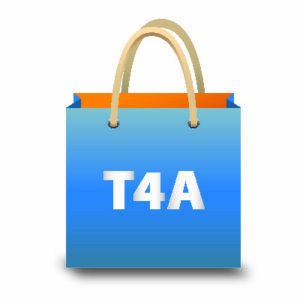 We had to settle on buying fresh fish from one of the park wardens who apparently had a permanent fishing permit. 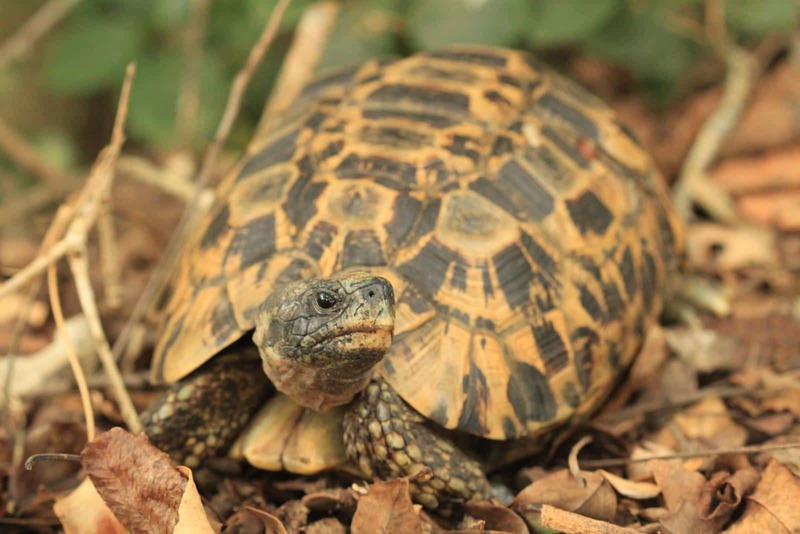 In the absence of big game, several small species visited our campsite. 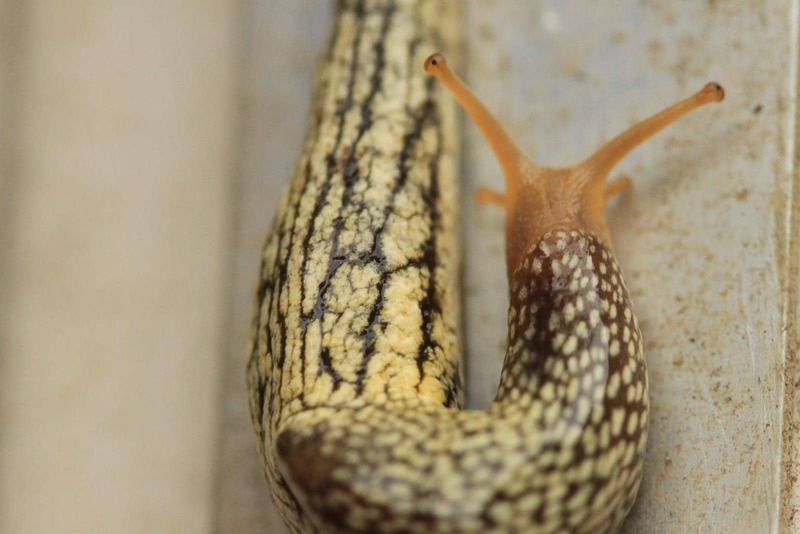 An interesting slug came to visit. The drive north from Mabibi to Khosi Bay epitomised the best of what we both hoped for on our journey north. We followed the deserted, narrow sandy coastal tracks, all the while enjoying the rolling, grassy countryside and patches of forest. 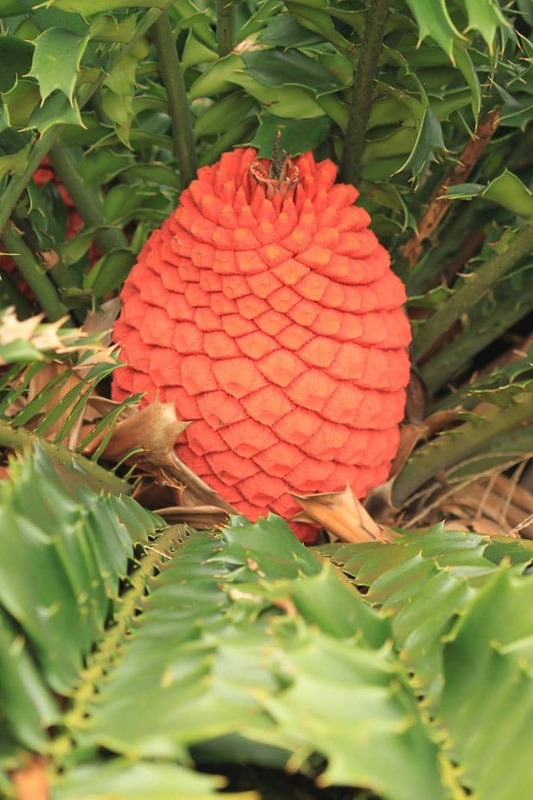 Further north we saw large, spiky cycads, some bearing fruit and others clustered together in large patches under shade. Being well off the beaten track gave us an exhilarating sense of freedom and the Tracks4Africa GPS map guided us unerringly, first to Lala Neck. This is also part of the iSimalangiso Wetland Park and after purchasing an entrance permit, we arrived at the deserted, secluded beach which had excellent snorkelling in the warm Indian Ocean. Despite the rising tide, we pulled on flippers and masks and were rewarded with a beautiful underwater experience, followed by piping hot coffee and rusks. Being totally self-sufficient and able to do this at any time is one thing that we really came to appreciate about our vehicle setup. Further on we came across some steep, uneven, sandy rises, and the Hilux, despite engaging diff lock and low range, finally protested at its 3.5bar tyre pressure. It was miraculous that we had made it thus far! After abortive visits to two unattractive camps on the south of Khosi Bay, we met James, a local guide, along the side of the road. Not having many other options and finally persuaded of his sincerity, we were greatful that he organised for us to camp at Bhanga Nek Tented Camp. Sundowner time was spent discussing our experience in finding this accommodation, both of us realising of what amazing value the new Tracks4Africa Guide App would have been on our trip but currently only covers Namibia and Botswana. With all the data and images available on that, we would have been much better equipped to find our own way here. Bangha Nek is not only excellent for fishing and snorkelling (we saw at least 20 different brightly coloured fish species) but it is also breeding ground to the Leatherback and Loggerhead turtles from October to March each year. The beautiful beach at Bhanga Nek.